Quicksilver AFI-6 is the first fully sequential LPG injection system designed and developed specifically for the HGV transport sector. Quicksilver sets new standards for reliability, economy, truck and driver safety and diagnostics. Quicksilver seamlessly blends both fuels in precise quantities optimising emissions and economy. All major components of Quicksilver, including the ECU, switch, software, firmware & harnesses, have been developed from a clean paper design by Mercury Fuel Systems. Quicksilver has been developed at Mercury’s R & D base in Avonmouth where the centre piece of the facility is a fully programmable 750BHP MAHA HGV chassis dynamometer. Emissions are tested using a 5 gas MAHA MGT analyser and fuel flows are measured using Endress & Hauser Mass Meters & AIC liquid flow meters accurate to better than 0.5 of 1%. Mercury personnel are recruited from the HGV electronics and LPG industries as well as from the top echelons of Engine Control Unit design. On-going design work continues into different dual fuel options using LPG, LNG and CNG and other alternative fuels. This radical approach has produced the Quicksilver-AFI for Euro 5 and Euro 6 engines, the most effective, safest and sophisticated HGV LPG diesel blend system ever seen. Fumigation systems introduce gas into the engine via a pipe that is connected into the air intake manifold. Sometimes this connection is made before the turbo. Unlike Quicksilver, single point systems require turbulence to ensure equal fuelling across all cylinders, a vital requirement for a healthy engine. This is a risk that Mercury is not prepared to take. Nearly all other systems rely on the vehicle’s ECU reducing fuel flows when compensating for the additional power generated by the gas. This causes a ‘lag’ effect which means that vehicles are consistently overpowered during acceleration, adversely affecting economy as well as upsetting the OEM. “Induction” or pre-turbo injection has additional issues. This technique leaves the turbo, manifold & intercooler full of a fuel air mix, damage to the vehicle in the event of a small shunt involving the intercooler has the potential to be considerably magnified. The considerable length of “fuelled” turbo pipe means also that fuel overrun can be a significant problem, particularly with regard to emissions and engine knock. From an economy perspective savings rely heavily on vehicles operating on the speed limiter when driving styles have little impact. Non-sympathetic driving styles can severely reduce savings and even eliminate them completely. In either system gas can only be introduced once minimum turbulence has been reached. Neither can gas be injected at turbo pressures of 80% or above, an area where the greatest savings are needed. A Quicksilver system provides each cylinder with a dedicated, electronically controlled injector delivering precise quantities of gas directly into the intake port on demand, vital for the long term health of the truck. To ensure that all cylinders are identically fuelled and remain at or below normal temperatures Mercury constantly monitors each cylinder temperature during the ‘mapping’ stage of every 1st of type. Using this system our technicians pick up minute variations in temperature and make the necessary adjustments before the truck goes “live”. In the quest for perfect LPG delivery Quicksilver constantly monitors LPG pressure and temperature and makes minute changes to the injection times in real time. Thus any change to gas density is picked up prior to injection and compensated for at delivery. The Gas Butler gives Quicksilver AFI the power to deliver gas at optimum ratios at all times. The feature is characteristic of the attention to detail of Quicksilver’s designers. Take the driver out of the savings equation. Deliver gas at boost pressures up to 100% meaning that even with heavy loads, strong head or shear winds, difficult terrain or urban driving routes significant savings will be maintained. Quicksilver is not dependent on minimum turbulence levels before gas can be introduced. Instead Quicksilver uses emission levels as a starting point for the introduction of gas. By not being dependent on turbulence more trucks can be economically converted, including smaller trucks involved in multidrop urban deliveries. Quicksilver is the safest dual fuel system for the driver and truck. Low Pressure Cut Out. Sensors ensure that low pressure, possibly caused by a leak or pipe failure, is detected immediately, disables Quicksilver and isolates the system at the tank. High Pressure Cut Out. Sensors ensure that any excessive pressure is detected immediately, disables Quicksilver and isolates the system at the tank. Service & Emergency manual system isolation. Allows the entire system to be isolated in an emergency situation such as an RTA or while being serviced in the workshop. Inertia & capsize isolation cut off. In the event of an RTA or sudden shock the system is automatically isolated at the tank allowing emergency service personnel to work in safety around the scene. Knock detection system immediately disables adjusts gas downwards when excessive knock is detected. If knock continues for longer than 5 seconds Quicksilver switches off, completely. “Black Box” storage capability to easily identify faults. Quicksilver constantly monitors system status, recording data which in most cases allows the technician to make an immediate diagnosis in the unlikely event of a system shutdown. 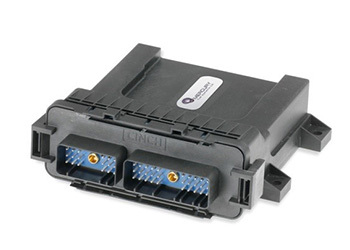 The technician accesses Quicksilver diagnostics via a USB connection in the cab switch. 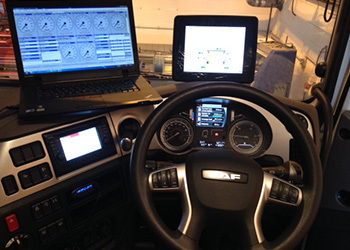 The laptop controlled diagnostic suite gives a complete insight into system status, allowing the technician to view system pressure, gas density and any parameters that may have been breached causing the system to shut down. The diagnostics also highlight any software issues or components most likely to be the cause of a system shutdown or reduction in efficiency. Faults can be diagnosed and in many instances corrected with the cab down, giving minimum downtime & inconvenience to the operator and driver. In simple terms the Quicksilver-AFI system replaces up to 30%-50% of the expensive and carbon-intensive primary fuel (diesel) with a less expensive and lower carbon-content secondary fuel, usually LPG or optionally, Natural Gas (CNG or LNG) This dual-fuel technology will deliver significant economic and environmental benefits to the Vehicle Operator. Under scrutiny Quicksilver produces substantial improvements in fuel economy. At 1.4/1 substitution Quicksilver averages 30% diesel substitution across a full range of loads & work regimes with trucks fitted with Euro 5 and 6 technology. Because of its unique flexibility Quicksilver can be used on the largest HGVs down to smaller delivery vehicles, giving fleet operators the opportunity to extend economies throughout the entire fleet and not just for the hardest working, heaviest vehicles. This enables operators to increase gas tonnage and achieve the best discounts available from gas companies.